73.18 % students cleared this year’s High School Leaving Certificate (HSLC) examinations in Manipur, results of which were declared here this afternoon. The HSLC exam was conducted by Board of Secondary Education, Manipur (BOSEM). A total of 27,126 out of 37,351 students passed the examination which was held in February this year. Of these, 11,550 were placed in first division, 14,558 the second and 1018 in the third. Last year, the pass percentage was 66.07 against 65.37 in 2016. Out of 37064 candidates appearing in the examination 18637 are male candidates and 18427 are female candidates and of them 27126 including 13991 males and 13135 females cleared the examination. The pass percentage of students from private schools was 80.84 and 62.01% students cleared from aided school. In the government-run schools, 50.59 % managed to clear the exams. Except one none of the student from the government-run school was seen among top 25 position holders. Like the previous year, girl students secured the top position in the HSLC exam. Yaiphabi Mayengbam of Little Flower School Imphal secured the top position with 573 marks out of 600 and Surjakanta Irengbam of Ch Thambou High School Mayang Imphal and Patel Lairenjam of Little Flower School Imphal jointly bagged the second position. Both secured 572 marks each. B Balkrishna of Padma Ratna English School Kakching and Angela Athokpam of Little Flower School Imphal were declared as the joint third toppers. Both secured 570 marks each. Yaiphabi is the daughter of Mayengbam Monokamta from Sagolband Tera Lukram Leirak in Imphal west district while Surjakanta is the son of Metrik of Mayang Imphal in Imphal West district. Patel is the daughter Sharatchandra of Utlou Mamang Leikai in Bishnupur district. A third position holder Balkrishna is son of Ramananda of Kakching Moiranthem Leikai in Kakching district and Angela is the daughter of Somdutta of Top Khongnang Makhong DC road in Imphal East district. 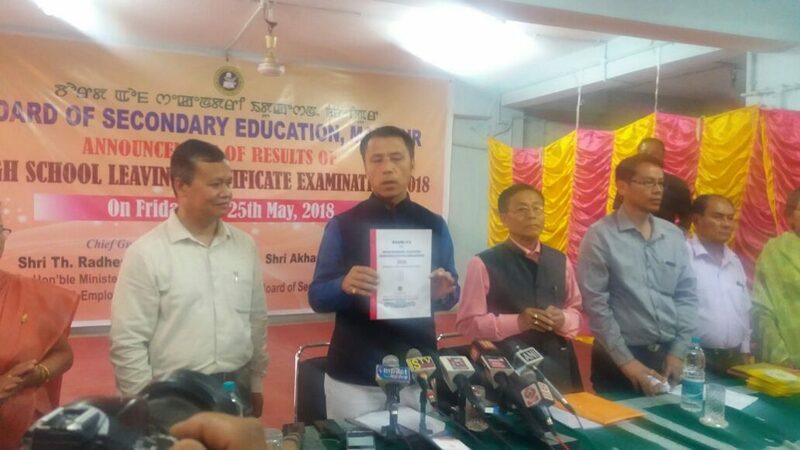 State education minister Th Radheshyam Singh announced the much-awaited result in the presence of Chairman Akham Joykumar Singh led BOSEM officials in a press conference at the office of BOSEM in Imphal.